The production of phenolic metabolites has been optimized in parallel to sugarcane micropropagation in temporary immersion bioreactors (TIBs). 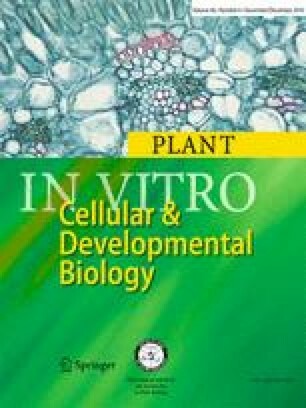 Culturing micropropagated plants in 0.4% CO2-rich air induced their photosynthetic activity by enhancing the change from a heterotrophic to a photomixotrophic metabolic stage. Under 0.4% CO2 enrichment, the transcript levels of both phenylalanine ammonia-lyase (PAL EF189195) and ribulose-1,5-biphosphate carboxylase/oxygenase (Rubisco CF576750) increased and were correlated to a 4.6- and 6.3-fold increase in the phenolic levels when plants were multiplied in 20 or 30 g/l sucrose, respectively. A novel application of plant phenolic metabolites as elicitors of resistance to tomato bacterial wilt in the Solanum lycopersicum–Ralstonia solanacearum pathosystem has been identified. The culture media was collected, and the phenolics were sprayed onto tomato plants infected with R. solanacearum, eliciting and/or maintaining an early defense signaling mechanism that resulted in the protection of the plant against the tomato bacterial wilt disease. RT-PCR analyses confirmed that selected genes from defense-related pathways were differentially expressed between plants treated with sugarcane metabolites, non-treated pathogen-free plants, and non-treated plants inoculated with R. solanacearum. The authors are grateful to Anita K. Snyder, USA, for copyediting and revising the manuscript. Thank you to the postdoctoral fellowships of Ariel D. Arencibia and Elva R. Carmona at Guangxi Academy of Agricultural Sciences (GXAAS).